Max out your megahash rates! 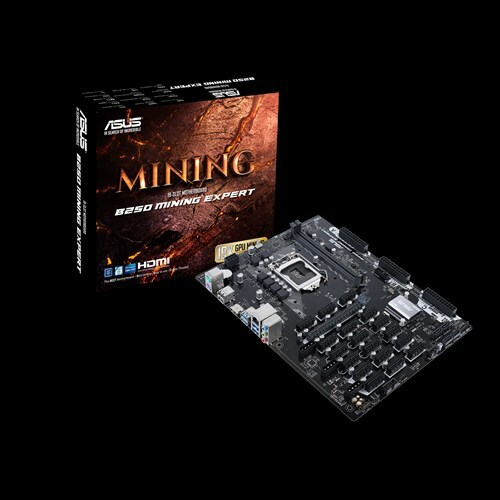 ASUS B250 Mining Expert is the world's first mining motherboard to feature 19 PCI Express® (PCIe®) slots. 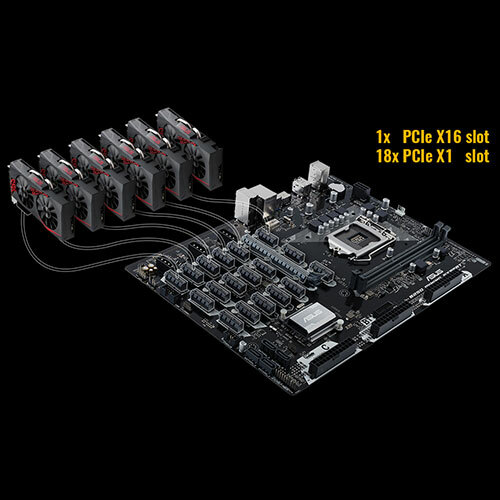 With 18 PCIe x1 and one PCIe x16 slots on board, plus three zoned ATX12V power connectors, B250 Mining Expert lets you run up to 19* NVIDIA or AMD GPUs in parallel to max out your megahash rates! B250 Mining Expert has been engineered to provide all the power your GPUs demand, cleanly and efficiently. The 19 PCIe slots are grouped into three distinct zones, each powered by its own, dedicated 24-pin ATX12V power connector — reducing wiring complexity and ensuring ample power delivery to all PCIe slots. Stable, low-noise power is a serious benefit for 24/7 cryptocurrency mining. That's why we've engineered B250 Mining Expert with 19 decoupling capacitors. These quality components smooth voltages and reduce high-frequency noise, so your GPUs get the good-quality power delivery needed for reliable operation. B250 Mining Expert has built-in smarts to show the status of each and every graphics card from the moment you power up. The moment the Power-On, Self-Test (POST) screen appears, you'll see a graphical representation of the status of every slot — so you'll know instantly if there's a problem or whether your mining operation is good to go. Unlike some rival boards, B250 Mining Expert has a special Mining Mode that's enabled by default, removing the hassle of having to make BIOS-level changes that are necessary to maximize mining performance. Mining Mode sets the PCI Express speed to PCIe 1.0 and disables the Compatibility Support Module, so you get the best stability and compatibility right out of the gate. B250 Mining Expert is equipped with Intel Gigabit Ethernet for the best throughput and lower CPU overhead, ensuring optimum performance from your mining rig. ASUS-exclusive LANGuard employs advanced signal-coupling technology and premium surface-mounted capacitors to improve throughput — protecting the B250 Mining Expert from lightning strikes and static electricity. Due to Intel chipset limitation, DDR4 2400 MHz memory frequency is only supported by 7th Generation Intel processors. Higher memory modules will run at the maximum transfer rate of DDR4 2400 MHz. ** Due to Intel chipset limitation, DDR4 2133 MHz and higher memory modules on 6th Generation Intel processors will run at the maximum transfer rate of DDR4 2133 MHz. Dimensions (W x L) 12.0" x 9.1"